Using local anesthetic, a strip of skin is painlessly and safely removed from the back of the head by a doctor. The hair roots are then dissected out under microscopes by a team of medical technicians. These roots, called “follicular units,” are then placed into tiny slits made by the doctor into the thinning and balding areas of the scalp. These roots heal in their new positions and begin to produce growing hair in about four months. 5. The area in the back of the head where the strip of skin was taken (known as the donor area) is stitched closed. It heals leaving a linear scar that is easily and immediately concealed by the surrounding hair. Usually, this area may be tapped again for more hair if needed in the future. Dr. Dan McGrath prepares for an FUT procedure. The Strip procedure is known as the gold standard of hair transplantation and the main foundation of the hair transplant industry. No other procedure provides the quality and consistency of growth that Strip transplant surgery does. While hair transplantation has been available since the 1960s, it largely took the form of plug surgery, which was primitive by today’s standards. Results were unnatural, the procedures required long healing times and the amount of hair that could be taken in a single sitting was severely limited. Large diameter punches were used to remove the donor hair which meant wide areas between the punch holes had to be left untouched for the skin to heal properly. It’s like having a huge wheat field but only being able to harvest small sections of it. This inefficient process required multiple visits to achieve a cosmetically significant improvement. To address this limitation, pioneers like Dr. O’Tar Norwood, Dr. Bill Rassman, Dr. Bob Limmer, Dr. David Seager and others began removing a long strip of skin from the back of the head and stitching the remaining skin edges back together. This required greater skill and more staff than just punching out plugs, but it was well worth the effort. Far greater numbers of undamaged grafts could be obtained in a single sitting and the donor area suffered less trauma and scarring. 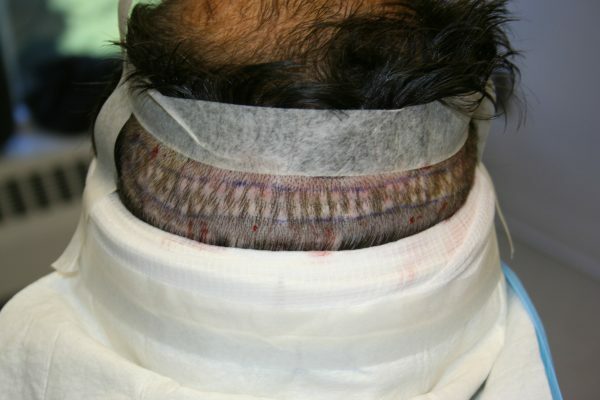 Instead of a checkerboard of scars in the donor area, as always seen in plug surgery, the follicle transplant method left a relatively thin line of scar that was easily covered by surrounding hair. Follicular unit hair transplantation surgery had demonstrated so many advantages and eliminated so many old disadvantages, that a worldwide industry was born. Before the invention of the Strip procedure the hair transplant business was just a mom-and-pop operation performed primarily as a side procedure. Afterward, it became a global industry, taking the world by storm. Its growth continues to this day. The demand for Strip hair transplants exploded. Medical societies like the International Society of Hair Restoration Surgery (ISHRS) were formed. Doctors wrote articles in peer-reviewed journals and authored new textbooks. Strip surgery had literally rewritten the book on hair transplantation and completely reshaped the surgical hair restoration landscape. The plug doctors were out and the Strip doctors were in, where they remain to this day. When you’re looking for hair transplant information, keep in mind that the way hair transplants are performed today owes its origins to this incredible procedure and the pioneers who created and shared it.